Perhaps hoping to inspire your own Pop-Tarts culinary experimentation, Kellogg's transformed their cereal cafe in Times Square into a limited-time Pop-Tarts Cafe through February 26, 2017. 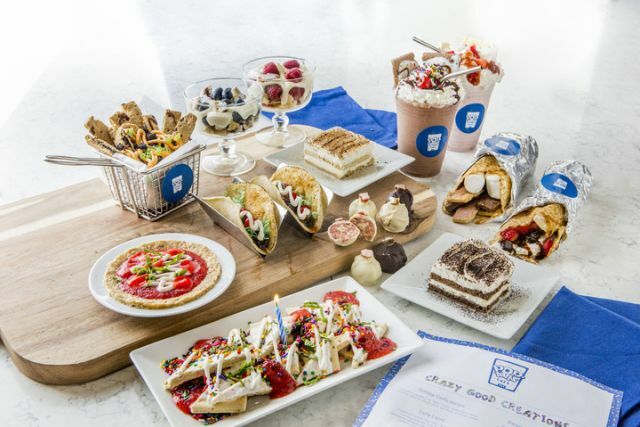 They've basically taken Pop-Tarts and incorporated them into sweet dessert versions of "classic New York dishes and young adult favorites – like pizza, cheesecake and burritos." - Birthday Fiesta Nachos - $9 - Frosted Confetti Cupcake Pop-Tarts "chips" topped with strawberry "salsa," frosting "cheese," fresh mint, sprinkles, and a birthday candle. - Personal Pop-Tarts Pizza - $8 - Frosted Brown Sugar Cinnamon Pop-Tarts crust topped with strawberry "marinara sauce," frosting "cheese", fruit leather "pepperoni," and fresh mint. - Tarty Tacos - Two for $9 - Crumbled Frosted Cookies & Creme Pop-Tarts "ground beef," coconut "lettuce," jelly bean "tomato," strawberry sriracha "salsa," and frosting "sour cream" in a cinnamon-sugar-dusted corn tortilla. - Chili Pop-Tarts Fries - $8 - Frosted Chocolate Chip Pop-Tarts "fries" topped with Cookies & Creme Pop-Tarts "ground beef," orange frosting "cheese" and sour stick "scallions." - Shakes - $12 - Milkshakes with various Pop-Tarts blended in. - Cheesecakes - $8 - Featuring various Pop-Tarts crust. - Tart-a-misus - $8 - Pop-Tarts soaked in espresso layered with mascarpone cheese and cocoa powder. - Cake Poppers - Three for $9 - Frosted Cherry, Chocolate Fudge and Cinnamon Roll tart-truffles. For those who prefer the classics, the cafe also offers 18 varieties of Pop-Tarts for $1 a piece.